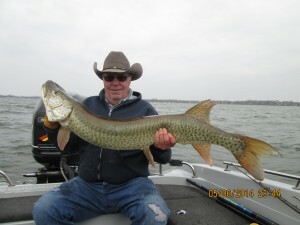 Dennis got this 49″ Muskie yesterday. He named her Lucy and let her go to be caught another day. I hope to see her again real soon! We also picked up a few Walleyes and some Crappie. The bite was a little slow but this fish sure made his day! This entry was posted in Fishing Report and tagged blue gills, Clear Lake, crappie, Fishing, Fishing Report, Guide, guide service, ice house, Iowa Great Lakes, iowa guide, Iowa Musky, kevan pauls guide service, walleye, Yellow bass on May 9, 2014 by Kevan Paul.